Anyone who knows me well knows how much I love craft beer. And I love wide varieties of brews: stouts, porters, wheat beers, sours, red ales, pilsners, scotch ales — even certain IPAs. The craft beer category in the US has grown swiftly in popularity in recent years, both in sales by volume and by revenue. Microbreweries have grown their production at a tremendous rate from 2004-2017, going from an annual volume of 700,000 barrels in 2004 to 5,600,000 barrels in 2017. A culturally and economically fascinating category of craft beer is the Trappist variety. Trappist beer is produced by monks, friars, and nuns, both for their own consumption and for limited sales to finally support their abbeys. The tradition of trappist brewing dates back to the Trappist Order, a group of Benedictine (followers of the Rule of St. Benedict of Nursia) monks residing at La Trappe monastery in France, in the 17th century. 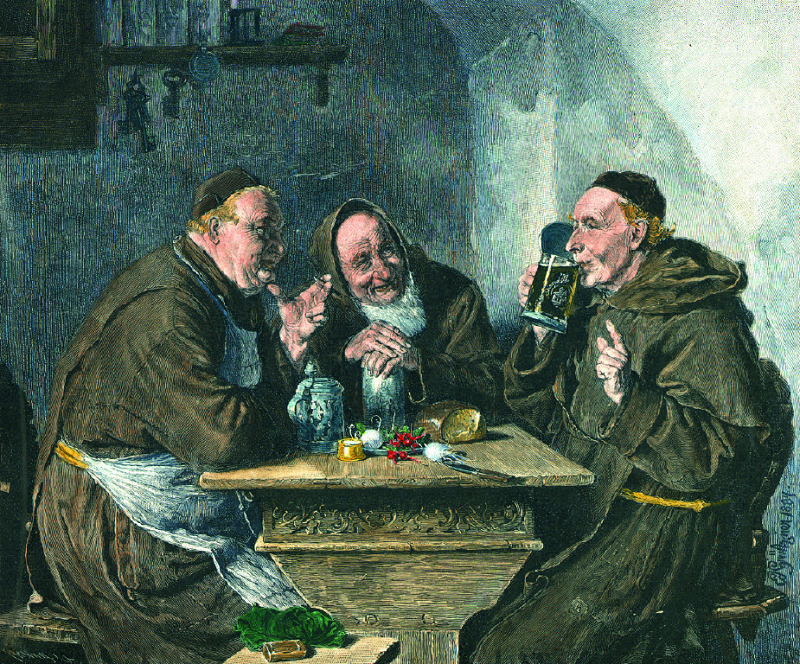 This brewing came out of still earlier beer-making by Medieval monks, who did it for many of the same reasons — to maintain their economic self-sufficiency in a way that had the added benefit of contributing to goodwill among the local population and secular leaders. Today, the International Trappist Association is the highest authority on official trappist goods, including beer. The Association recognizes thirteen trappist breweries today: 6 in Belgium, two in the Netherlands, one in Austria, one in the US, one in Italy, one in France, and one in the UK. The UK brewery, located at Mount St. Bernard Abbey, is the most recent, having opened in 2018. The awarding of the label requires a thorough investigation by the ITA board of directors. This incldues a close look at hte production process, and the level of sales. The ITA requires certain environmentally-consious and fair labor standards, and, abbeys may not sell beer so excessively that they make profit on top of what is needed for the abbey’s maintenance and local charity. The license allowing a product to be ceritfied Trappist must be renewed every five years. What type of beer is trappist beer? Trappist beer comes in several varities, but is alomst always an ale rather than a lager. Ales are typically made with “top fermenting” yeast, meaning they are fermented at high temeprature, whereas lagers are made with “bottom fermenting yeast” and ferment cold. Generally, trappist beer will be a blonde or brown ale of varying strength, but generally with low bitterness and higher fruity and sometimes spicy notes. More generally, abbey breweries use the term Enkel (“single”) to describe their basic and lightest recipe, typically today with an alcohol by volume of 4-6%. Dubbel is the net level up, with an alcohol by volume of 6-8%. The term refers to a brown ale at most abbeys, with the fruity and spicy notes common in many Belgian styles. Tripel and Quadrupel are heavier, with ABV of 8-10%, and 10-13%, respectively. The move from Enkel through to Quadrupel refers directly to the process of malting in beer production: these trappist beers are single, double, tripel, or quadrupel malted, aka, a Tripel has 3 times the malt in the wort as a “regular” or single ale. “Sweet wort” is the mashed up, seeped, and heated barley before the yeast and hops are added. Once hops are added this becomes bitter or hopped wort. What is the best trappist beer? That depends who you ask, but the company BelgiBeer (a Belgian craft beer mail order gift box retailer) has an authoritative list. Note that all of these beers are Belgian in origin, so some bias may be involved. It’s also fair to note that Belgium is the home to the largest concentration of trappist breweries, and Belgian craft beer in general has a long and prestigious history, especially for the type of hearty, fruity, spicy ales most associated with abbey brewing. Where can I buy trappist beer? Due to the limited supply and distribution networks, trappist beer was until very recently, very hard to get a hold of as an American consumer. Some abbeys still only sell to within a few kilometers of their brewery. But some brands, such as Chimay, (from Chimay, Belgium,) are available easily online, such as at www.sauveur-biere.com. Some local beer retailers specializing in imports may also carry the more produced and sold beers like Chimay. An example of one such retailer is Beers of the World, in Henrietta, NY. I’ve had the pleasure of taking the Beers of the World course at Rochester Institute of Technology this semester, where I learned a great depth of information about a wide range of beers, including trappist. I got to try the Chimay Blue, Red, and Tripel varieties in class, and we had an eductional video and lecture about trappist beer. I recommend that anyone who already likes beer try one of these unique brews with such an interesting history. If you don’t like beer, I recommend you go to your local brewery and try some more varieties after a tour to learn more about the production process and what diversity of flavors are available among all the different types of this ancient and sophisicated beverage!